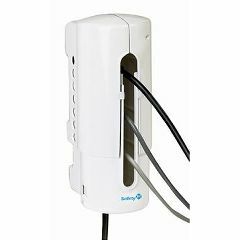 The Power Strip Cover from Safety 1st is an innovative home safety aid covers your entire power strip to help protect your children from all the plugs and cords. Power Strip Cover is ideal for home office equipment, telephones and nursery monitors, the Power Strip Cover adjusts to securely enclose an entire power strip and can even be wall-mounted. I ordered several items and was extremely pleased to find them delivered 2 days later...the quality and pricing was the best I found on the internet. I will continue to order in the future.